In a large saute pan over medium high heat, melt butter then add apple wedges. Stir to coat apples in butter. In a small bowl, combine 3/4 cup sugar, cinnamon, cloves, allspice and salt. Sprinkle over the apples, stirring to combine. Lower the heat to medium and cook until apples are tender, approximately 8 to 10 minutes. Sprinkle the flour and cornstarch over the apples and continue to cook, stirring occasionally, another 5 to 6 minutes, or until juices start to thicken. Remove pan from heat, add apple juice, stir and scrape fruit mixture into a bowl and allow to cool completely. Place a baking sheet on the middle rack of the hot oven. Remove one disc of dough (or one pie crust) from the refrigerator and roll it out on a lightly-floured surface until it is 12-inches in diameter. Fit this crust into a 9-inch pie plate, trimming the excess to a 1/2-inch overhang. Place in the freezer. Remove second disc of dough (or one pie crust) from refrigerator and roll out the dough, on a lightly-floured surface, until it is 10 or 11 inches in diameter. Cut the rolled out dough into 1-inch strips to form a lattice pattern for the top crust. Remove pie crust from freezer and fill with the cooled pie filling. Cover with the dough strips in both directions to weave and create a lattice pattern. Press the edges together, trim the excess, then crimp the edges with the tines of a fork. Place pie in the oven on the baking sheet and bake for 20 minutes. Reduce temperature to 375 degrees F and continue to cook until it is bubbling and the crust is golden brown, about 30 to 40 minutes longer. Remove from oven and allow to cool on kitchen rack for two hours. 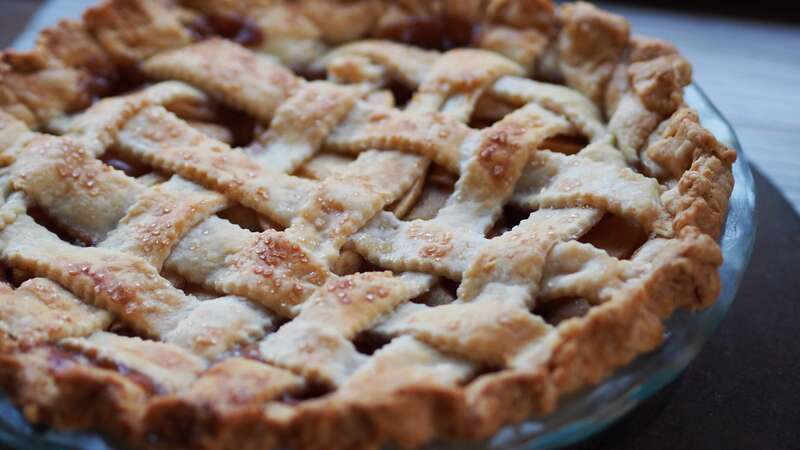 *Search for the Flaky Pastry Pie Crust recipe and prepare the recipe resulting in 2 pie crusts.